Some tantalizing billboards have popped up in Prague’s Smíchov district; tantalizing that is if you’re a fan of American Tex-Mex fast food chains – and international travel. 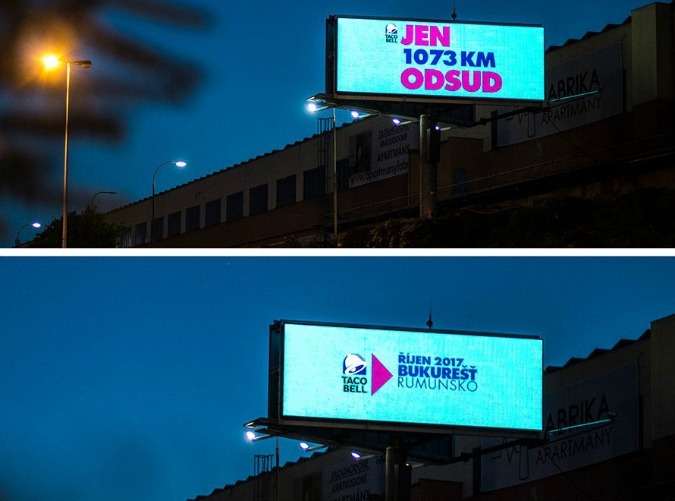 But before your mouth starts watering for the authentic taste of a Chalupa Supreme, hold onto your diablo sauce: the billboards are part of an ad campaign for a Taco Bell opening in Bucharest, Romania. Ad agency McCann dreamed up the gimmick to promote the new location with ads in Budapest (396 miles away); Vienna (518 miles away); and right here in Prague (644 miles away). “Anybody from the region can enjoy a Crunchy Taco, a Fajita Burrito or a tasty Quesadilla from Taco Bell and visit Bucharest at the same time. It’s only a flight away. Or a slightly longer drive. But hey, you get plenty of time to enjoy the view,” the agency said in a press release. With the recent opening of a Pizza Hut in the food court of Prague’s Palladium Mall and the news yesterday that Czechia is one of the most unhealthy nations in the world, maybe the country can do without the added temptation? While many of us will remain satisfied with the handful of great Mexican restaurants and taco trucks the Czech capital has to offer (and even the not-so-great ones which serve up decent Czech Mex in a pinch) there’s still one group of locals who would like to get their Cheesy Gordita Crunch on. Before you go crossing borders to satisfy your crunchy-taco cravings, see here for some Prague Mexican food options.